Yes, it's only the best vehicle for butter and salt! Delicious! Do you like worms in your corn? Well if you're not for worms in your corn then you must be for GMO's? Well then you're for spraying - a lot of spraying? Hmmm.... you're in a tough spot then. At a tailgate market a customer asked, "Is your broccoli genetically modified? It's so big!" I mean her comment was a compliment...right? But genetically modified broccoli doesn't exist so it was mute point. GMO's are such a hot button issue but there is still a lot of confusion surrounding them. 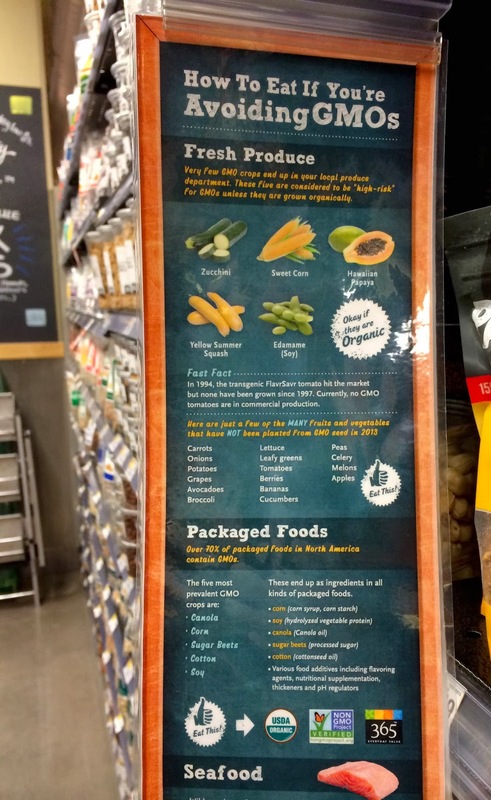 Our good friends at WholeFoods (I am a big time lover of WholeFoods) did us a kindness by making these great shelf talkers on what to consider when shopping to avoid GMO's. The truth is you're far more likely to be consuming genetically modified organisms when you're wheeling your cart around outside of the product section. There are only a few things that are genetically modified that you'll find fresh and in "raw" form. There is such a disconnect between the produce section, meat section, dairy section and the rest of the grocery store. In those three sections: organic, non GMO, grassfed, naturally grown, etc. etc. are asked about and scrutinized. But much more rarely are we questioning weather our favorite beer, snack foods, or cereal fall into at least 1 of above categories. An example: at the farmers market there are prepared food vendors. Does anyone walk up the lady making crepes and ask about the organic-ness of every single ingredient she's using? I'll answer that...No! As the saying goes, "The road to hell is paved with good intentions and money (I added the last little bit)." GMO's were born out of an attempt to feed more people with less space in a cost effective manner for consumers who demand perfect products (worm free). While we strive for perfection, we do live in an imperfect world and weather we like to think about it or not...bugs are part of that world. They are part of the food system. They are organic. They are natural. They are not something to be grossed out by. They are not something to get upset over. Anyone that has bought corn has stood over the corn wagon peeling back the silk and husk of each ear to ensure they are buying a bug free ear corn. A perfect ear of corn. Any ear that happens to have a visible worm staring back at you or perceived worm damage is violently and quickly flung back into the pile. What does genetically modifying corn do? However most early corn is not genetically modified. Less bug pressure. First being, it is a very saturated market around my town. It would be silly for me to grow it. Second I don't want to field thousands of questions about GMO's and on the flip side, I don't want complaints about worms in the corn. So we are a GMO free farm and we are also a corn free farm. Kills 2 birds with 1 stone. 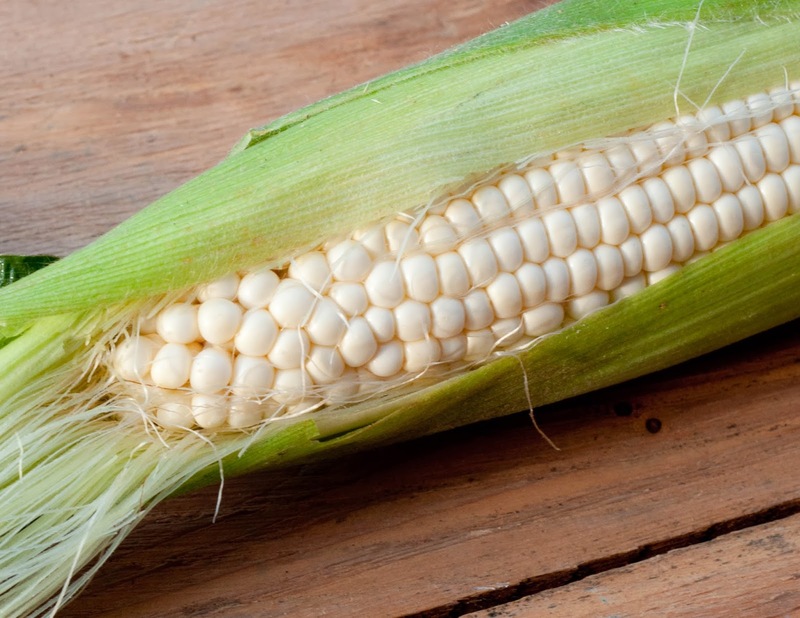 Of coarse corn can be grown organically. If you put mineral oil on the silk of each ear corn is becomes slippery so the worm can not make it into ear. The worms are still there they just can't crawl up hill on a slip and slide. I don't have time for that at this point in my life. Maybe something for the 5 year plan. If we don't want GMO's we as consumers need to embrace the worm in the corn. It doesn't address all issues of coarse but it's a good place to start. It would make things easier on everyone (probably not Monsanto). Less pressure on farmers and less stress for consumers and we would be removing ourselves from the control of a large patent holding corporation. I know a guy who has a "garden" (like 2-3 acres) which he doesn't spray at all. I said to him one random day last summer, "Your corn is going to have worms." His response, "How would I know the corn is sweet if it doesn't have a worm? If it's good enough for them it's good enough for me." There are no villains in farming...I'm talking about the people actually out in the field. There is no: organic farmers are the good guys and conventional farmers are the bad guys. No sir! There is no: Organic farmers are a bunch of unshaven unwashed hippies playing farm on 3 acres and conventional farmers are throwing spray here, there, and everywhere while trying to feed world. No, not true either...especially since we all know organic farmers spray too! Farmers were just trying to do what we wanted. Well we got it. We got more, cheaper, and almost perfect. Are we happy? So the next time you find a worm in an ear of corn I hope you'll smile, bravely put it in your cart, take it home, cut off the end with the worm and enjoy your dinner...unworried, un-intimidated and empowered.